During the ice ages of the last one million years, sea levels dropped as much as 400 ft., increasing the land area of Europe by 40%. That terrain, once home to early humans, is again underwater, and archaeologists have identified artifacts at 2,500 sites. But all of it is threatened by erosion and offshore projects. Our human precursors lived 125 miles inland from the coast of the Black Sea more than 1.5 million years ago; in northern Spain more than one million years ago, and on the British coast of the North Sea at least 800,000 years ago. Early tribes migrated from Africa through the Middle East, and then along the Mediterranean shore, as well as through central Europe, occupying northern territories when the ice melted and retreating southward when the ice expanded. These migrations across continental shelves, including the abandonment and re-occupation of ancient coastal plains, took place many times. The slowly melting glaciers also created vast areas of wetland and marshes that became densely populated habitats. Immediately questions arise: Who or what lived on the new land? Was it inhabitable by people or animals? At what dates or periods in the past was the land exposed? How did the enlarged geography of Europe affect migrations into the continent from Africa and the Middle East? How did people respond to falling sea levels, and how did they preserve their basis of subsistence when the land was inundated again? How did they react to continuous climate change? When did humans, or our hominin precursors, first learn to exploit fishing and shellfish, and where and when did they build the first rafts or boats? What unique configurations of fauna, vegetation and people existed during those climatically unique times on the exposed shelves producing the antecedents of the more recent marine provinces, especially from the mid-Holocene? These questions have intrigued archaeologists for many decades — and the answers lie beneath the sea in the mud and sediments of the continental shelf. Many people are surprised to learn that fragile artifacts and the remains of humans, animals and plants can survive underwater for such extended periods of time. But a number of factors contribute to their preservation, including inundation by mud, peat, wind-blown sand and — for objects in caves — accumulated debris from collapsing rocks. Local topography, such as indentations, estuaries and lagoons, can also shelter and safeguard prehistoric objects. Already we know that some prehistoric material on the sea floor can survive for more than 10,000 years….Amongst the thousands of sites that diving archaeologists and geoscientists have already found are submerged Mesolithic villages in the Baltic, a cave with its only entrance at 40m below sea level and painting on the rock walls inside above sea level, flint fragments and worked tools from a site buried in sediments in the North Sea about 300,000 years old, a fragment of a Neanderthal skull from the North Sea, and early Neolithic villages at a depth of 15m in the sea off the coast of Israel, complete with fresh water wells, cooking hearths, organics, and hut foundations. The human remains at Atlit off the coast of Israel are well-preserved so that the population age structure and mortality rates can be derived. In fact, well-preserved artifacts made of organic material — like tools made from antler, wood or bone — are found more frequently underwater than on dry-land sites of the same age. Notably, many submerged sites include those that demonstrate the earliest stages of seafaring and fishing. Archaeologists have found canoes, paddles, rope, string, charcoal, and fish-traps thousands of years old. Vegetation remains, pollen, peat, river valleys, terrestrial landforms, shoreline features, cliffs, caves, deltas, and other environmental indicators can and do survive on some parts of the continental shelf. Prehistoric peoples roamed over large areas to hunt for food and may have followed migrating herds of animals and changed their focus of activity with the season. The whole terrain and landscape, including rivers, springs, caves, coastal lagoons, and the feeding grounds of large mammals needs to be understood if we are to recreate the way of life on the drowned continental shelf. Unfortunately, the growing excitement among archaeologists comes at a time when demand for offshore real estate is at an all-time high. Human activities such as fishing, aquaculture, drilling, pipe and cable laying, dredging and offshore wind farms are all competing for limited space. 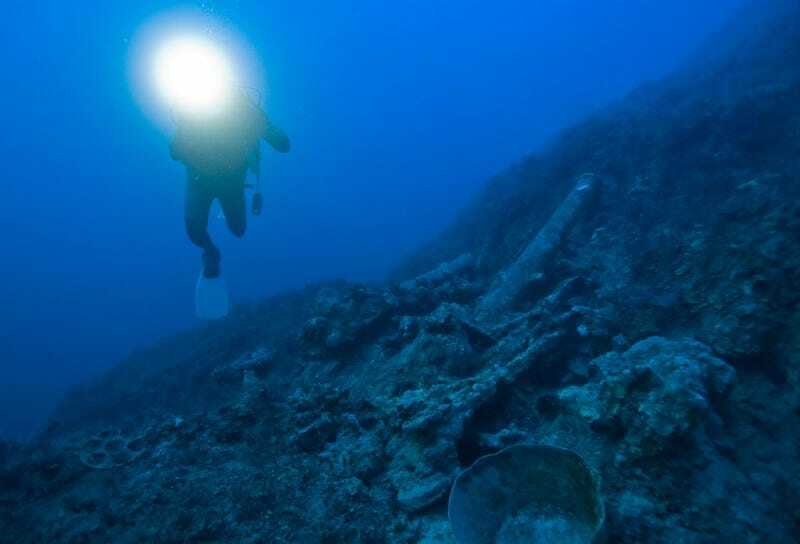 For the maritime archaeology community, these activities represent a double-edged sword. On the one hand they can damage and destroy culturally valuable sites and artifacts; on the other, they often alert researchers to the existence of sites that might otherwise have remained undiscovered. Coastal erosion also presents a threat, as it often leads to the exposure of prehistoric artifacts that have been embedded waterlogged layers for thousands of years. Once uncovered, they can easily be attacked and destroyed in a few years by migrating shipworms, piddocks and other species. Right now, the infrastructure isn't in place to catalogue and excavate these sites before they're damaged. To that end, the European report offers several recommendations. For starters, progress will move much more quickly if there is greater cooperation among scientists from multiple disciplines. It will require the combined skills of archaeologists, paleontologists, oceanographers, marine geologists and experts in climate change to decipher the clues on the ocean floor. New codes of conduct are proposed for industries, to establish protocols for reporting finds and leaving artifacts in situ until they can be investigated. And, recognizing that the money required for such an effort is likely more than individual countries are able and willing to provide, the researchers are looking to drum up funding from international organizations and European Union agencies. The alternative is to watch prehistoric history literally get washed away.